Another tree-hit house in our neighborhood. 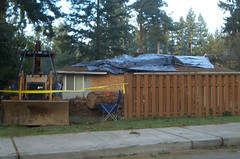 When I drove by the day after it happened, there was a clear view of hte back yard where that sheet of plywood is now. You can see the size of the tree that went through the house. Yikes.